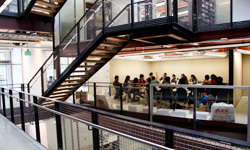 The Product Design program at Drexel University prepares students to become intelligent designers through extensive learning in an applied studio setting where skill development and design thinking take place. We offer a 4 year Bachelor of Science degree in Product Design specializing in a multidisciplinary design approach focused on product development and commercialization. We also encourage collaboration through entrepreneurship, sustainability and innovation in product development. This is accomplished by a broad and self-directed education combining the fields of Art, Business, Engineering and Technology through the lens of design. Our graduates work in a wide range of industries including consumer electronics, housewares, furniture, fashion accessories, medical devices, toys, transportation and, now more than ever, their own startups. Today’s world needs people who can bring meaningful ideas to life. With a curriculum that encourages experimentation, making and learning, the Product Design program believes that a design education is gained through the process of discovery. This education activates experiential learning and empowers the mind to make new connections, synthesize new meanings and create novel solutions to difficult problems. The Product Design program lets students discover and follow their passions while offering a first-rate education that includes the co-op experience, study abroad, multidisciplinary collaboration and, ultimately, a chance to make a difference in the world. Drexel's Product Design program is ranked 9th in the U.S. by The Art Career Project for Industrial Design Schools.